Editor’s Note: Back in February, Macworld ran a primer on using the Personal Hotspot feature that debuted with the Verizon iPhone. Since that time, Apple unveiled an updated iOS that brings Personal Hotspot to iPhones running on AT&T’s network as well. The following article is an updated version of our earlier primer for AT&T iPhone subscribers. Throw away your MiFi! Forego the heartbreak of tethering! Give up the struggle of Internet Sharing from a mobile broadband modem through your laptop! The iOS 4.3 Personal Hotspot feature can slice (through your mobile bill), dice (up your cables), and make pounds and pounds of Wi-Fi devices connect to the Internet. But, wait! There’s more! Personal Hotspot does its job well, too. 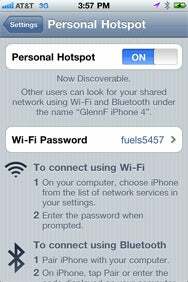 The Personal Hotspot update included in March’s iOS 4.3 update turns a GSM-based iPhone 4 into a portable wireless router that can share its Internet connection with other devices. Up to three pieces of hardware with standard Wi-Fi adapters can connect to the iPhone's micro base station. It can't, however relay one Wi-Fi network to other devices—for instance, it can't share an expensive hotel Wi-Fi connection with colleagues' machines, an iPad, and itself. We previously covered the ins and outs of the Personal Hotspot feature that arrived on the CDMA-based Verizon Wireless model of the iPhone 4 with its custom iOS 4.2.6 release. iOS 4.3 isn’t yet available for the Verizon model, but was released March 9 for GSM iPhones, enabling this feature with carriers who choose to support it. AT&T is one of those. We’ve created this new version of this article to explain the AT&T version of Personal Hotspot, which has slight differences from its implementation on Verizon phones. The biggest of those is the maximum number of devices of each kind you can connect. Verizon Wireless allows a maximum of five devices in any mix of tethering and Wi-Fi with the limit of one over USB, three by Bluetooth, and five by Wi-Fi. AT&T drops the Wi-Fi maximum to three devices, but still allows a total mix of five across USB, Bluetooth, and Wi-Fi. Other GSM carriers may opt for up to five Wi-Fi connections, according to reports. Setup and use is as simple as one might hope from iOS and AT&T’s billing department. First, you need to enable the feature on your AT&T account. AT&T offers three ways to do this. You can call the company’s customer service line (611 on your phone); you can access your account features via AT&T’s Website and make the change; or you can use the free AT&T myWireless app for your iPhone to make the change through a features section. The Personal Hotspot feature requires the DataPro tier of AT&T’s data plan, which is $25 per month for up to 2GB of data. The Personal Hotspot features adds $20 per month, but also beefs up monthly data usage to 4GB. This is a combined pool you can use either for data consumed or produced by apps on the phone and any tethered or Wi-Fi devices. On an iPhone 4, you can connect to other devices via Wi-Fi as well as through Bluetooth and USB. The iPhone 3GS only supports Bluetooth and USB. An AT&T spokesperson confirmed that you may enable or disable the Personal Hotspot feature (as with the previous tethering feature) at will and with no additional fees. You can also switch between DataPro and the cheaper 200MB DataPlus plan at any time if the Personal Hotspot option is turned off. However, if you still have an unlimited data plan with AT&T—the carrier pulled those last June but let existing subscribers keep their $30-a-month plans—once you switch to the DataPro plan to use Personal Hotspot, your days of unlimited data are over. You can never go back. AT&T said that you can opt by phone or Website to choose a retroactive plan change, which changes the charges for the billing period to date; or for a pro rata upgrade, which starts charging from the date you change for that portion of the month. The pro rata option also metes out just the amount of data you’d get for that part of the month. A colleague made this change, and a problem with his account setting required a call instead of a Web site click. A customer-service representative was able to sort it out for him via a chat session. Unlike the Verizon implementation of Personal Hotspot—which generates a password with a word, two digits, and another word—AT&T’s version is a four- to five-letter word followed by four digits. While brute-force methods may crack short Wi-Fi passwords—if someone was really that interested in breaking into your mobile hotspot—any password with letters and numbers longer than nine digits long is considered unbreakable by currently known methods. You may replace the Apple-generated password by tapping in the field. A password must be at least eight characters long (a mix of letters, numbers, and punctuation), but try ten. The hotspot feature relies on Wi-Fi's WPA2 Personal protection, a seven-year-old encryption standard that's available in all AirPort base stations and cards shipped starting in 2003, and in nearly all other Wi-Fi gear shipped since 2003 or 2004. If you have an old iBook with a plain old AirPort Card in it, or a device that only offers the original 802.11b flavor of Wi-Fi, however, it won't be able to join the network. You can share simultaneously through USB, Bluetooth, and Wi-Fi, but you can selectively disable either wireless method. Disable Bluetooth (General -> Bluetooth) or Wi-Fi (main screen, tap Wi-Fi), and you reduce battery usage a bit, as well as quiet the radio environment around you. 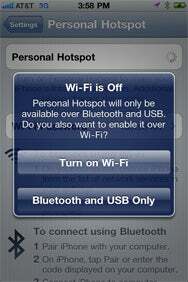 When you flip Personal Hotspot to On, it will ask you if you want to enable Bluetooth or Wi-Fi if either is turned off. USB is always available, but you can enable and disable USB tethering on the computer side, even when you have an iPhone plugged in for charging or syncing, via the Network preference pane. A blue bar appears at the top of your iPhone screen when a device is connected to your hotspot. A blue bar appears at the top of the screen when a device is connected to the hotspot, much like the green bar that shows an active call when you're not in the phone app. Tap the bar to open the Personal Hotspot setting screen. The bar displays a count of connected devices, including USB and Bluetooth. If no devices are connected by any network method, the Wi-Fi radio will power down after 90 seconds, and the hotspot will no longer broadcast its availability to Wi-Fi devices. Just unlock the phone, and navigate to the hotspot settings screen to wake it from its slumber. In testing, I occasionally also had to toggle the hotspot switch to Off and back to On to reactivate Wi-Fi. Bluetooth remains continuously active whether or not devices are connected. Because Personal Hotspot looks to a computer or other device just like any Wi-Fi connection, you can carry out any task and use any service. This includes FaceTime on an iPhone or iPod touch relayed through the hotspot (not on the iPhone running the Personal Hotspot feature). This is also true if you're connected via USB or Bluetooth. Throughput seems to be about the same whether you're using apps on an iPhone or connected to the phone as a conduit to the Internet. On AT&T’s network, I was able repeatedly to reach 1.5 to 2 Mbps downstream and 750 Kbps to 1 Mbps from a speed-testing app on the phone, and the same speeds from connected computers. In a comparable test with a Verizon Wireless iPhone 4, I was unable to beat 500 Kbps downstream. Your mileage will absolutely vary, although AT&T's network, in areas with good coverage, will almost always be faster than Verizon's due to the current generation of mobile broadband technology in use by each firm. Things get complicated if your iPhone 4 is within range of a Wi-Fi network to which it has previously connected. With Personal Hotspot turned on and at least one device connected by Wi-Fi, USB, or Bluetooth, the iPhone will force a connection to AT&T’s 3G network, and maintain the hotspot connection. However, if no devices are connected, when the hotspot feature slumbers, the iPhone switches to the available Wi-Fi network. You can also switch to using a Wi-Fi connection for Internet access with the Personal Hotspot active. Navigate to the Wi-Fi setting, and tap a button—Disconnect Wi-Fi Clients—that only appears if you have folks connected by Wi-Fi. While that option won't show up if Bluetooth or USB tethering is in use, the iPhone still only uses 3G for the feature; it won't share a Wi-Fi connection. If devices are connected via Wi-Fi using Personal Hotspot and you want to bump them and switch the iPhone to use a local Wi-Fi network instead of AT&T's 3G service, you can tap Disconnect Wi-Fi Clients instead of turning off the Personal Hotspot feature. When you're ready to turn the hotspot feature off, use Settings to tap the Off button in the Personal Hotspot item. In my testing, Personal Hotspot used a reasonable amount of battery power, and noticeably drained the iPhone over time, but it's nothing compared to, say, an active GPS navigation connection. You could likely use Personal Hotspot for several hours of routine use (not continuous streaming or downloads) starting with a full charge. I recommend plugging in an iPhone via USB or a power adapter to avoid running out of juice. Because iOS puts the hotspot feature to sleep when nothing's connected, you can leave it turned on and essentially in standby when you're not using it. The biggest worry you might have with the feature is burning through data. You are likely more aware of the bandwidth you're consuming on an iPhone, which automatically throttles certain kinds of data usage when connected via 3G: streaming slows down, you can't download music, movies, and apps larger than 20MB, and other more subtle techniques make the phone less talky. But connect a laptop or mobile device via Wi-Fi, and you might use up the monthly allowance by retrieving an iOS GPS navigation update.